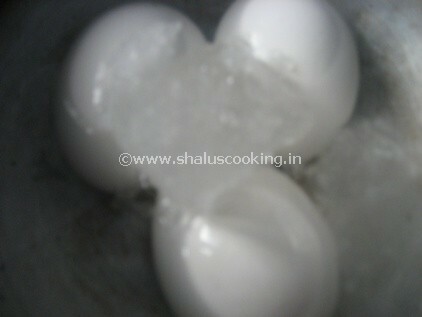 Shalu's Cooking: COOKING TIPS: How to Hard-Boil the Eggs and Cut them Neatly? COOKING TIPS: How to Hard-Boil the Eggs and Cut them Neatly? 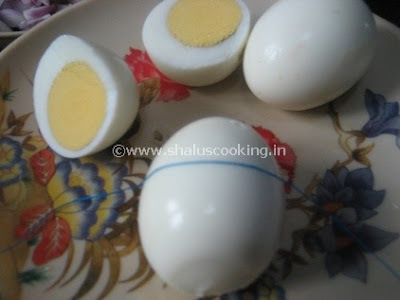 How to Hard-Boil the Eggs and Cut them Neatly? In this post I have shared the method to hard boil the eggs without breaking and how to cut them neatly. Initially when I started cooking, if I boil eggs either it will break or it will be half boiled :( But slowly I learnt how to boil it without breaking. Also when we cut the eggs for making egg masala or gravy, it will not be smooth in the cutting line and the yolk will separate on cooking. So I have showed you how to cut it neat and nice. Rock Salt - 1 tbsp. 1. Keep the ingredients ready. 2. 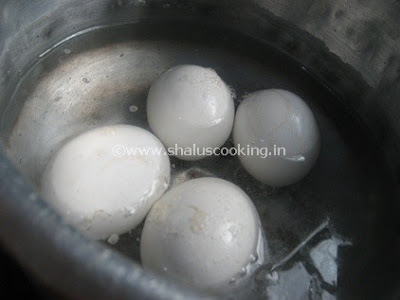 Add Eggs in a pan and add water till the eggs are immersed. 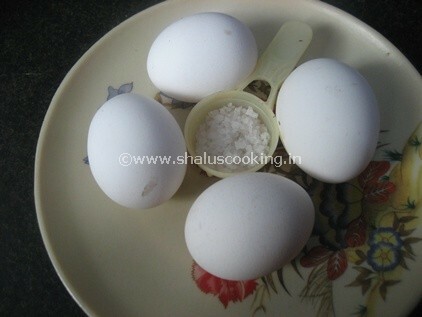 Sprinkle the rock salt over the eggs. Cook on low flame for first five minutes and allow it to cook on high flame for next 5 minutes. Switch off the flame. 3. 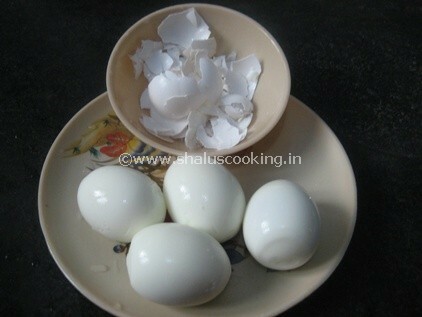 Drain the water immediately and place the eggs in bowl containing plain water. Add few pieces of ice cubes to the plain water. Let this sit for about 10 minutes. 4. After 10 minutes, drain the water and take out the eggs. Remove the shell of the egg slowly. Thats it! Hard - Boiled Eggs are ready. 5. To Cut the eggs, take a clean thin thread and gently press the thread in the middle of the egg by holding both edges of the thread. You can cut the eggs neatly when you use a thread instead of a knife.